This article is the third in a three-part series on safe motherhood in conflict settings. The three delays of maternal mortality—delays in seeking care, reaching care, and receiving care—are exacerbated by conflict and cause hundreds of preventable deaths every day. Join experts at the Wilson Center on August 28 for a discussion on maternal health and armed conflict. By the end of 2016, almost half of Yemen’s health facilities were not fully functioning and more than 270 health facilities had been destroyed or damaged in conflict. “On top of this, drastic budget cuts have left health facilities without funds for operational costs and health care workers without regular salaries since September 2016,” the UN reported. At Yemen’s Al-Thawra Hospital, unpaid staff serve approximately 1,500 people a day. Khaled Suhail, the hospital’s director, told the UN that “with no funds for operational costs, we never know if we will still be open one month from now.” A continuous influx of displaced people threatens to overwhelm the already struggling health system. Similarly, only half of Syria’s health facilities are fully functional. In February 2018 alone, “violent incidents disrupted 15,000 medical consultations and nearly 1,500 surgeries, many life-saving,” reported the Voice of America. The disruption is especially problematic for women needing emergency obstetric care. “Like in other armed conflict settings, women in Syria are suffering from gender-based violence and a lack of access to high quality health care—particularly during pregnancy and delivery,” according to an article published by Harvard University’s Maternal Health Task Force (MHTF). Syrian women in refugee camps also have limited access to health facilities. The Al-Areesheh refugee camp, established in 2017 and home to more than 3,500 displaced Syrians, has no standing health facilities. The lack of health facilities in conflict settings is compounded by a lack of health professionals. “Health workers may be killed, injured, too distressed to work, displaced, or they may have fled,” states UNFPA’s State of the World Population 2015. “A midwife’s scope of work could meet the needs of most women in these displaced settings,” including family planning, menstrual health, domestic and sexual violence, and pregnancy, said Sera Bonds, CEO of Circle of Health International in an interview with MHTF—and midwives are also cost-effective, she added. “At the core of…humanitarian action, from response to resilience and development, are sexual and reproductive health and rights,” states UNFPA. Understanding the barriers facing pregnant women in complex emergencies is the first step to ending needless maternal deaths—and creating a more resilient society. 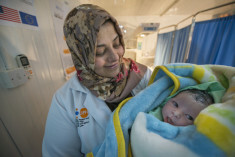 Photo Credit: Dr. Rima Diab, a doctor at an ECHO-funded UNFPA clinic in Jordan’s Zaatari camp, holds Omar, the latest baby to be born at the clinic. Photo credit: EU/ECHO/Peter Biro.